Roxie Jean Simcoe left this world in the comfort of her home, surrounded by family, on Dec. 16, 2013, after a valiant battle against cancer. Roxie was born in Burley, Idaho, to Roxie and Leonard Daugherty on Oct. 29, 1938. An only child, Roxie formed very special and lifetime bonds with her cousins and childhood friends. They were her siblings. In 1947, Roxie’s parents moved from their farm in Burley, Idaho, to Shoshone, where they opened the J.I. Case farm implement store. Her relationship with her childhood home instilled the qualities that made Mom who she was. It was there that she learned about the importance of community, friendship and hard work. Upon graduating high school in 1956, Roxie went to Cottey College in Nevada, Mo., and then to the University of Idaho, where she joined the Delta Delta Delta Sorority. It was at the university where Roxie met the love of her life, Doyt Simcoe. When Dad asked her if “she wanted to go shopping,” she said yes and they were married in the First United Methodist Church in Shoshone in 1960. Doyt and Roxie had 53 incredible years of marriage in which their love resulted in their three children: Bryan, Scott and Stephanie, and then their five grandchildren: Cameron, Samantha, Gillian, Brody and Josie. Mom loved her role as a wife, mother and grandma. Roxie wore many hats in her life. At her core, she was always a dietician and loved the science of nutrition. At the University of Idaho, Roxie’s professors recognized her abilities in the field, forming relationships that lasted a lifetime. Upon graduating, Roxie worked for a time as a dietician at St. Anthony hospital in Pocatello but left the profession to raise her family. Although Mom did not work as a dietician again, she never stopped being one and incorporated it into her life, teaching people and family about the importance of good food. And boy, did she know how to make GOOOOD FOOD! After nearly 16 years away from the working world, Roxie entered the job market again as a Consumer Science Representative for Idaho Power. For 13 years, she was a familiar and friendly face for the company as she traversed the Magic and Wood River valleys, presenting programs for civic organizations and school children. At the age of 55, Roxie pursued her dream of being a business owner and bought Desert Sun Travel Agency, where people became very familiar with her signature look in her 1955 Chevy Bel Air. We remember Roxie saying, “Well, I guess we better go on a cruise to see what all the hoopla is all about,” and nearly 20 cruises later, Roxie and Doyt discovered the world by boat. China, Europe, Panama, the Caribbean, the Mediterranean, Alaska, Mexico and the Holy Lands were among some of their favorite adventures. Roxie had a special knack of putting tours together and making certain that her clients had a stellar experience. When people saw “Roxie’s Going Cruisin’” ads, they knew it would be a great trip. Even after her first battle with cancer and extensive radiation and chemo treatments, Mom boarded a plane two weeks later, taking 30 people on a three-week river boat tour through Europe. Roxie was amazing. Roxie was interested in everything and everybody. She loved history, reading, sewing, cooking and traveling. She had the gift of gab and it seemed like she knew everyone. If you were with Roxie, no matter where you were, you always planned on adding extra time to the excursion because she was bound to run into someone she knew. For Mom, life was one big reunion! 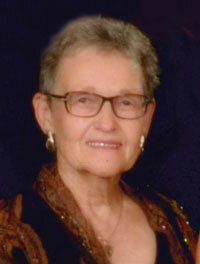 Roxie believed in community and she was an active participant. She enjoyed volunteering and was active in Soroptomist and PEO, Chapter D. She served on the University of Idaho Alumni Board and rarely did she pass up an opportunity to attend a Vandal event. She had boundless energy. This August, Mom surprised Dad with a family cruise to Alaska, celebrating his 80th birthday. Twenty-five friends and family joined in on the fun and we are forever grateful for the memories. The cancer had not yet revealed its ugly head and if Mom was having pain, her determined mind effectively blocked it. The doctors said she shouldn’t have been standing, yet she was as vibrant and active as always. Thanks, Mom, for her trip of a lifetime. Roxie is survived by her husband, Doyt Simcoe of Twin Falls; her children Bryan and Randye Simcoe of Hailey, Idaho, Scott and Holli Simcoe of Bozeman, Mont., and Stephanie and Steven Hanchett of Boise, Idaho; her five grandchildren; cousins Bill Moody and Clairnell Kelley of Missouri and Becky Blackledge of Seattle; and countless friends. She is preceded in death by her parents, Roxie and Leonard Daugherty, and a baby daughter, Anne. Roxie’s service will be held at the United Methodist Church in Twin Falls on Friday, Dec. 20, 2013, at 11 a.m. A viewing for family and friends was held Thursday night at Parke’s Funeral Home from 6 pm to 8 pm. The family requests that in lieu of flowers, donations be made to the First United Methodist Church of Twin Falls, the University of Idaho Scholarship Fund or to donor’s choice of charities. Those who wish may share memories and condolences on Roxie’s memorial page at www.magicvalleyfuneralhome.com.